SuperAgers, Arthur, 95 and his wife, Lola, 90 found their way to San Miguel de Allende, Mexico just a few years ago. They picked up and moved to a foreign country, never looking back. Both come to the Live Like You Can Gym to train their bodies, finding “Boxing for Life” just the solution to stay young and fit! “I wake up every morning, excited and eager to go to the gym and have fun with Janis. We use all of her fitness “toys” including the POWER PLATE which has made walking the cobblestone roads of San Miguel de Allende, Mexico a piece of cake. Training with Janis has even improved my trumpet playing. At 88, I feel strong, fit and looking forward to performing forever. Joan M. & Dan W.
Dan and Joan showed up at the Live Like You Can Gym 2 years with the desire to see what was possible now. They packed and moved to San Miguel de Allende, Mexico 3 years ago in their 7th and 8th decade of life. Resilience, flexibility and courage were the tools they used to make the move. Dan and Joan are true SuperAgers. She always said that exercising at the gym kept her from being a couch potato. 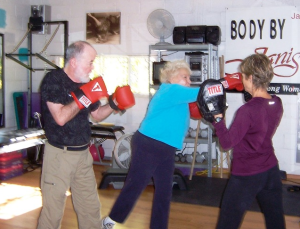 Dotty Vidargas passed on at 87 after religiously exercising for the last 7 years. She always showed up early in the morning to workout before going to work. Dotty worked out until the last week of her life. Her spirit lives on in my gym. 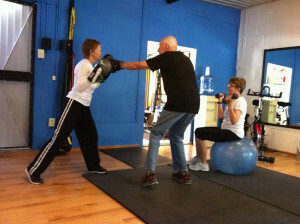 Martha S & Patricia C.
Patricia, 88, has been training in the gym for 12 years, never giving up and showing up when she can. Pistol Pat and I had a ball giving boxing exhibitions around San Miguel de Allende. Don’t Stop, Hop ‘Til You Drop! 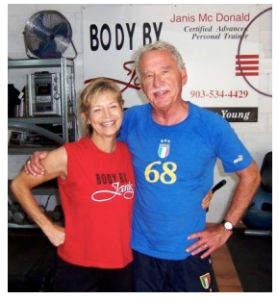 When I was in my early sixties, I felt so young at heart yet my body was not keeping up. I found Janis’ program and for the last 35 years have been using her plan. Now at 97, I feel youthful and in better shape then when I was in my 50’s. I tell everyone, that it’s better to burn out than to rust away. I just keep on going. 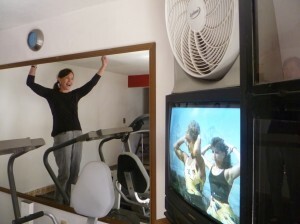 “When I was in Hawaii, I watched Body by Janis TV Exercise Program while working out on my treadmill. Her energy and enthusiasm keep me exercising. Occasionally I would join her in a hoot and yell. I was so happy to find Janis in San Miguel de Allende, Mexico. 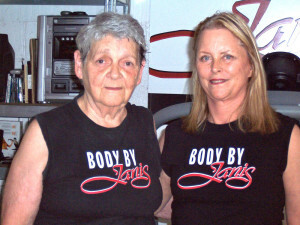 Over the last 11 years, my husband and I trained at Janis’ Gym. The workouts carried us through many interesting times in our lives (broken bones, replacements and more). 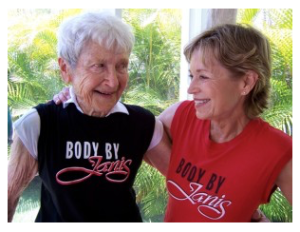 Sometimes we come to Janis for rehab and other times we come to preserve our strong bodies.